Myrtle Beach Sailing School’s advanced program has been created for those that have previous sailing experience and would like to earn multiple certifications in one visit. 2 student limit per class, unless family (4ppl max), allowing you more time sailing. All courses require a non-refundable $150 per student deposit. Once received, all instructional materials will be mailed to you. Final payment is due one week before you arrive and can be paid via your reservation student portal or emailed invoice. Advanced 1 teaches the novice/intermediate sailor the required skills to cruise safely as both skipper and crew on an auxiliary powered sailboat in near-coastal waters, then advancing to a multi-day cruise upon inland/coastal waters in moderate/heavy winds and sea conditions. Day 1 you will be expected to successfully complete ASA101, this includes the 100 question written test and on-the-water skills. Expected knowledge includes basic sailing terminology, parts and functions, helm commands, basic sail trim, points of sail, tacking and gybing, seamanship and safety including basic navigation rules to avoid collisions and hazards. 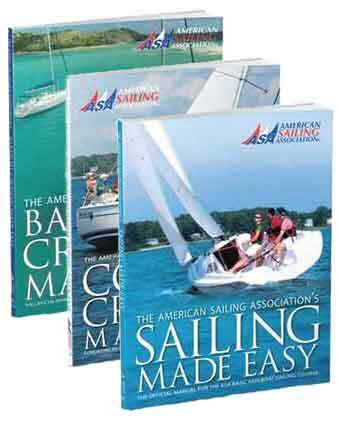 Days 2-4 you will learn cruising sailboat terminology, basic boat systems, auxiliary engine operation, docking procedures, intermediate sail trim, navigation rules, basic coastal navigation, anchoring, weather, safety and seamanship. Days 5-7 you will learn about provisioning, boat systems, auxiliary engines, advanced sail trim, coastal navigation, anchoring / mooring, docking, emergency operations, weather, and more. Please contact us for our 3 or 4 student family pricing. We will be anchoring at un-inhabited Bird Island or other locations as well as a 25 to 30 mile ocean sail to Bald Head Island, NC. This program is available for those with previous sailing experience only. You will be expected to be capable of successfully completing ASA101 on day 1. Please call us to discuss.